Three millions years ago Violent eruptions of Mount Erciyes (3916m) and Mount Hasan (3300m) covered the surrounding plateau of Cappadocia with tuff, a soft stone comprised of lava, ash and mud. The wind and rain have eroded this brittle rock and created a surrealist landscape of rock cones, capped pinnacles and fretted ravines, in colours that range from warm reds and golds to cool greens and greys. 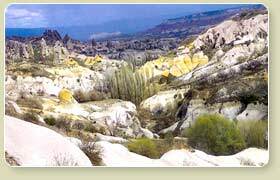 Goreme is one of those rare regions in the world where the works of man blend into the natural surrounding. During Byzantine times chapels and monasteries were hollowed out of the rock, their ochre-toned frescoes reflecting the hues of the surrounding landscape. Even today troglodyte dwellings in rock cones and village houses of volcanic tufa merge harmoniously into the landscape. Cappadocia is also natural wonders and unique area in the world with its history. We trek, exploring the surreal landforms of the Goreme valleys and enjoying the colourful blaze. Following ancient pathways we visit the strange rock cut churches and monasteries carved from the soft volcanic tuff. Meeting at the airport and transfer to the hotel. Overnight hotel. Leaving the capital city behind, we head southeast towards Cappadocia. We pass the massive ‘ Tuz Golu’- one of the salt lakes in Turkey and also stop at the 13th century Agzikarahan caravanserai. It is constructed to develop the trade about at every 40km. The gate is a fine example of Seljuk architecture and is a reminder that we are travelling one of the ancient caravan routes linking Asia to Europe. Arriving to Selime village where we begin our first walk, at the northern end of the Ihlara valley and overnight in the valley itself. Overnight pension with breakfast. The narrow, steep-sided Ihlara valley, dotted with rock cut churches, was once the favourite retreat of Byzantine monks. This valley was formed by primeval earthquakes and the was once rushing river is now a quiet stream. As we walk along the winding valley, with cliffs reaching up to 170m in some places , we see small garden cultures that originally would have provided for the colonies and made them self supporting. There are many rock-cut churches is this valley with valley with well-preserved frescos dating from the 9th century. In the afternoon we drive to Goreme via the Underground City at Derinkuyu. 8 subterranean levels stretch 57 meters below ground. After visit continue to Goreme a town particularly renamed for its pottery and much of it is still moulded. Overnight at pension. We trek thorough the Akvadi (white valley) eroded so perfectly by time, rain and wind during centuries. On our way following a seasonal river, many strange curious rock formations and fairy chimneys round us. If we are lucky we can also see some wild birds. (like hoopoe) and some wild animals(like fox). In 3h walk our way gets us up to Uchisar village where we have lunch break in a restaurant. 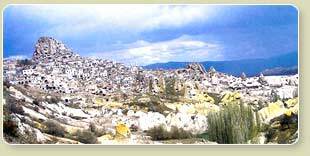 Uchisar village is settled around a high promoter, which is called citadel. We visit it walking to the top where we have rewarding panoramic view on all the surrealist Cappadoccia area. In the afternoon we follow a path to the Pigeon valley, and we will see some pigionaries that is holy for Moslem people. 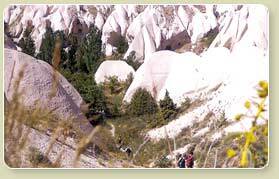 at the end of the walking we arrive to Göreme where we will overnight. After a short bus ride, we arrive in Kavak where we begin our walk. As well as the landscape, this region is also renowned for its wine as the fine volcanic soil is very fertile. Viticulture has been here since the Hittites, but it was the exiled Christians who really developed the vineyards and for a while. Other produce from these fertile soils include walnuts, mulberries and a variety of fruit. Often the largest rock cones are used as depots for citrus and other fresh fruit. We cross two typical village, Bahceli and Ayvali. Opportunity to experience authentic village life in central Anatolia. 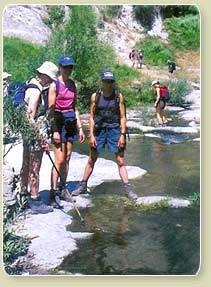 Our afternoon walk is in Gomede valley through the river. Overnight pension. Before we begin our walk we visit surrealist rock formation and churches of Pancarlik valley. The interesting sweeping curves on the valley flanks give a particular character to the region. We follow the river that will take us to Ortahisar village. We continue our walk through Kızılcukur valley. Sometimes known as the ‘’red hole’’ Kızılcukur is probably the hottest valley in region. Hidden in its array of fairy chimneys is The church with grapes where there are frescos depicting viniculture and fruit growing. (The vine produced here now is very sweet and heavy ) Overnight pension. 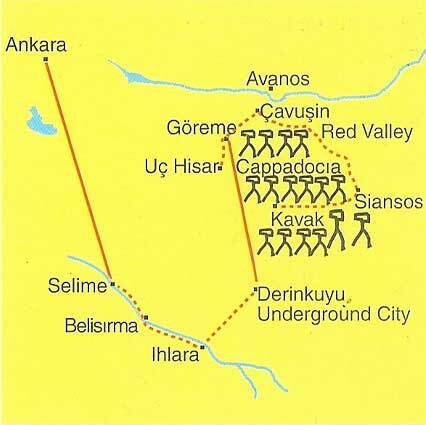 Our final day in this region will be spent by walking in Paşabagları, known as the valley of the Priests. Many of the chimneys here are only partially divided, showing us the continuous erosion process. This valley is also noted for the many caves in the fairy used by hermits for their retreats . The afternoon is pent driving back to Ankara. Overnight hotel.